Raise money by inviting friends and family to sponsor your December 10th letter writing. With every dollar that you raise, you’ll be supporting women human rights defenders who are under threat around the world. You can raise money on your own, or you can start a fundraising team. Spread the word, and win prizes! Start your own fundraising team! (Or fundraise on your own.) Customize your fundraising page. Add pictures and personalized text, and track donations. Get the word out! Use Facebook, Twitter, or email to let everyone know what you’re up to. Add people to your team! Easily include friends who share your passion for human rights as members of your team. Looking to support someone else’s Write for Rights fundraising team? Visit this page to view all the teams that are fundraising this year. Win prizes! 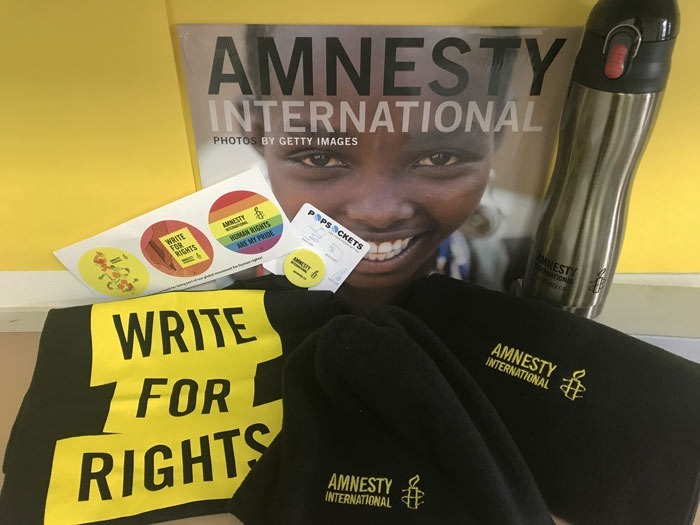 The campaign that raises the most money will be awarded the ultimate Amnesty International gift pack—you’ll be able to show off all your hard work and passion for human rights! Human rights are not a crime.Give to Amnesty Today.